• A powerful modern phone will give you the best results, not only with smooth framerate but also headtracking latency. Additionally, shutting down other background tasks may help with performance. To give you an idea of what to expect, <b>this experience runs at 50-60 FPS for the entire tour on a cool Nexus 5 running Android 4.4.3</b> and minimal background activity. • This program requires a phone with the NEON CPU extension (many modern phones have this). It may not work for you otherwise. • Cardboard is a low­cost, easy­to­get virtual reality viewer that transforms a phone into a basic VR headset. 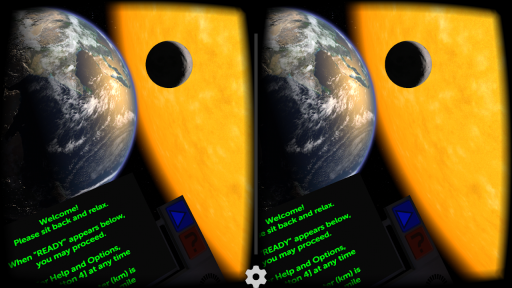 Learn more about Google Cardboard at g.co/cardboard. Buy or build your own at <a href="https://www.google.com/url?q=https://www.google.com/url?q%3Dhttps://www.google.com/get/cardboard/get-cardboard.html%26sa%3DD%26usg%3DAFQjCNF_w-I3hEh8tEgqyhg7qO4_wIqPog&sa=D&usg=AFQjCNHguyvHlcDhCy5QePg0GbY5PNS-SQ" target="_blank">https://www.google.com/get/cardboard/get-cardboard.html</a>. • <b>Compare the sizes</b> of planets and moons - everything is toy-sized, shrunk down to 1 millionth of their actual size. Distances between objects are not to scale to make comparisons easier. 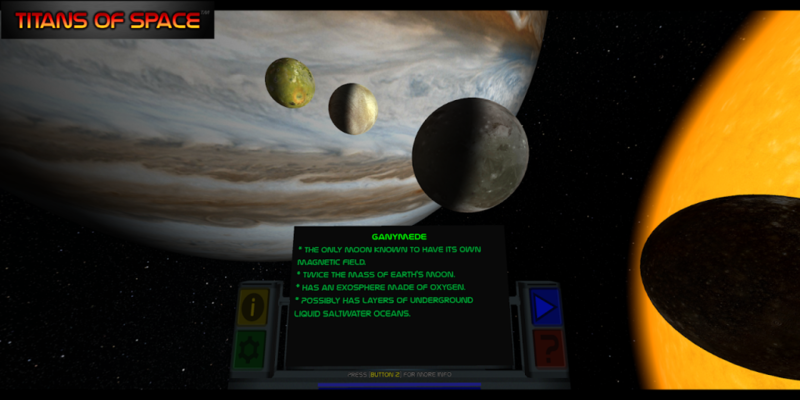 • <b>Feel the dynamic soundtrack</b>, carefully matched to your tour. • <b>Enjoy full control</b> over the pace and depth of your tour through a multitude of options, though just kicking back with the defaults is fine too! • <b>No form of input is necessary</b> to experience the full tour, though if your headset has a strap, using <b>a controller is recommended for comfort</b>. The next best thing is to use a phone with NFC support with a Cardboard headset that has a magnetic switch, or a Cardboard 2.0 headset that can tap your phone's screen. • <b>Catch up on what's new</b> in the Solar System! Your cockpit dashboard will display <b>informational text at most tour stops</b>. There are sometimes <b>additional pages of information</b> with extra detail. • <b>Translated into multiple languages</b>. Some portions of the experience are still in English, and this is not the fault of the translator(s) as I just didn't have the full text ready for them at the time. • <b>50 minutes of narration / voiceover is now available</b> as an add-on. To purchase this option, find the Narration panel in the green Options menu during the tour. • The <b>Narration add-on is now available!</b> Includes 50 minutes of narration for the entire tour. Male voice only for now, with a female voice coming soon. The narration is in English, and includes English subtitles as an option (off by default). To purchase this option, find the Narration panel in the green Options menu during the tour. • Built using Cardboard SDK 0.4.10. This should further improve app stability for many devices, and <b>an experimental drift correction mode is now an option</b> that you can select when starting up the app. Note that this drift correction is great for devices where the scene just keeps rotating and rotating, but if you already had a stable view it may make things worse with a "floaty" feel to the head tracking. Hopefully you will find a mode that suits you! 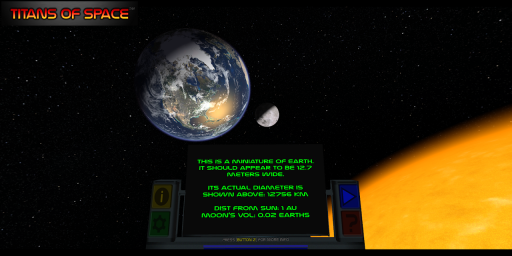 (There is a newer Cardboard SDK but there are currently some technical problems updating to that. Stay tuned.). • If you are still having trouble with drifting, one trick that can help is set the phone down on a flat surface for 20 seconds while the app is in VR mode. • On some phones, your view may occasionally jump suddenly. This behavior should be improved from before, but I suspect it's not completely solved yet. • If you ever need to reset your "forward direction", simply tilt your headset (with your phone in it) on its left or right side. 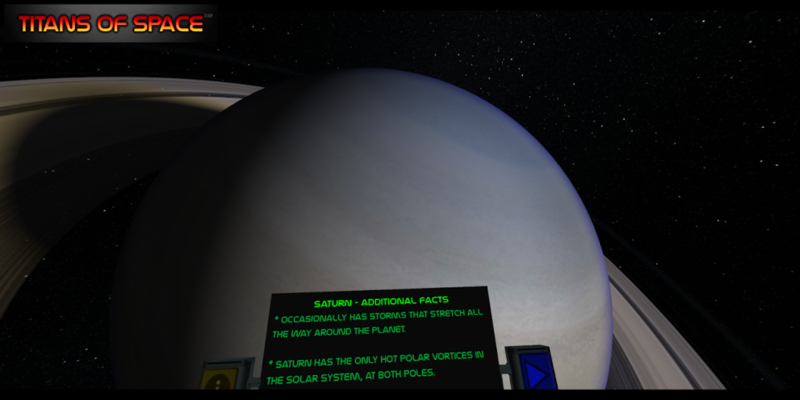 • Note that the tour isn't over yet after you've finished touring the Solar System!